The time from 1800 to mid-twentieth century is a transitional epoch for understanding of sleep and its disorders. With the rise of physiology, organic chemistry, and finally psychology, sleep became an object of experimental study. At the same time, the development of clinical science, especially neurology, fueled an interest in questions of consciousness, motor and reflex activity, and sleep–wake control by the brain. The increasing understanding of pathological and psychopathological processes led to an improved classification of sleep disorders. At the same time, the development of organic chemistry resulted in the development of new treatment options for various sleep disorders. Finally, the rise of electrophysiology, in the first half of the twentieth century, enabled to study the activity of the sleeping brain on a time scale from seconds to hours. 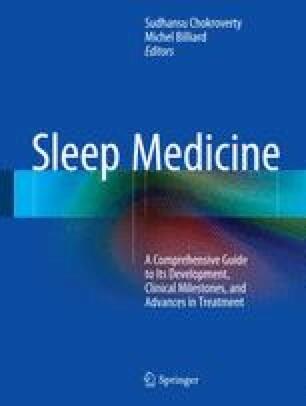 The resulting new understanding of sleep as a complex and highly regulated process allowed a better understanding of the pathophysiology of sleep disorders, and thus, became the basis for the development of sleep medicine as a medical subspeciality toward the end of the twentieth century. Finally, living and working conditions, which have changed dramatically during the period under discussion, led to a new appraisal of the role of sleep and its disorders. The Human Mortality Database. www.mortality.org/.